This blog has a long and detailed record on concern over health care spending. My posts have also acknowledged how difficult I think it will be to bring that spending under control in the future. After all, every bit of spending goes into someone’s pockets, and taking it away will be a massive hit in the wallet for many, many Americans. 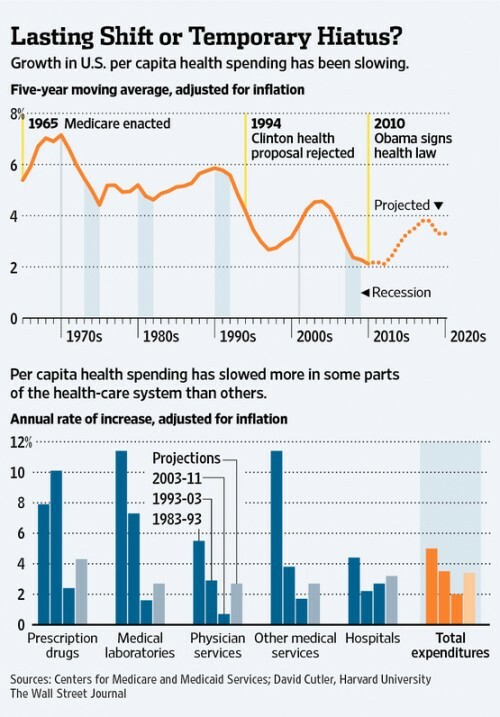 For the past couple of years, U.S. health-care spending has been growing at a surprisingly slow pace. A lot of this is the recession and its aftermath. Americans cut back spending on nearly everything but iPhones. They go less frequently to the doctor, put off elective procedures and cut back on prescription drugs. It is the most significant slowdown in health spending since the heyday of managed care in the late 1990s. “This has gone on longer than anyone expected, though the [economic] downturn has too,” says Larry Levitt of the Kaiser Family Foundation, which tracks health-spending trends. Harvard University economist David Cutler draws the opposite conclusion. He attributes about a third of the slowdown to the transitory impact of the recession, and another dollop to recent cuts in government payment rates to providers and to the drug industry’s inability to find pricey new drugs to replace the revenue from generics. But Mr. Cutler speculates a significant part of the slowdown reflects changes in consumer and provider behavior that will persist. Americans are using less health care because they are being forced to pay more out of pocket. Indeed, the share of insured workers with deductibles of $1,000 or more rose to 31% in 2011 from 18% in 2008, Kaiser estimates. “A lot of people are saying: Do I really need this?” Mr. Cutler says, who notes a distinct slowing in the pace of spending on CT scans, MRIs and other imaging. At the same time, he says, doctors and hospitals—prodded by employers and government—are changing the way they deliver health care, partly in anticipation of some features of the Obama law, such as penalties for hospital-caused infections. No one knows for sure, of course. If you forced me to answer, I’d say that I agree that our spending has been affected by a lack of new pricey pharmaceuticals as well as by increased cost-sharing. But both of those developments have their down sides. I’m less convinced that it’s early implementation of the ACA. I’d be happy to be proven wrong. 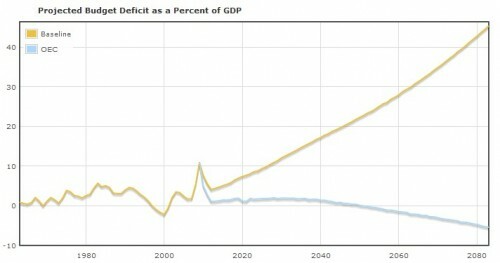 The yellow line is our projected deficit as a percent of GDP if things go along unchanged. The blue line is our deficit (surplus) if our health care spending instead increased at the rate of the average of the OECD countries. That’s the only change there. Keep on spending on defense, keep our planned discretionary spending, keep the Bush tax cuts. Let’s say it again – we don’t have a deficit problem, we have a health care spending problem. If we could get a little bit better at this, or if these trends continue or imporve, our long term fiscal outlook looks a heck of a lot better. The phrase “healthcare spending” tends to conflate two issues: how much are we spending and how much are we getting. There’s a real difference between spending less and getting less and spending less and getting the same. One major part of the US problem is that we’re spending a lot more than the rest of the world, but not getting anything for the additional spending. Spending more and getting more could be a reasonable trade-off. Spending more and getting nothing more is evidence of a serious problem. Anyway, that’s my issue on just focusing on the amount spent. Thank you so much for sharing. If we can fight against obesity which is the source of many related health issues then, we can save more in a two way process. Good luck! I have researched much as I am not convinced that weight loss surgery is my option, and I am glad that I found something that saved me from the surgical knife cost and complications as well as irreversible damage. Roca Labs gastric bypass no surgery has helped me loss 43 lbs and still counting… I am glad that I am winning back a healthy weight. I am sharing this to let others know that there is an alternative to surgery and a healthy approach to weight problem. Please don’t get me wrong. Just a caution — the CEPR calculator cheats in that its “projection” uses current health care cost rates for the OECD — not OECD projected rates. It also ignores the fact that half of the increase in our federal budget health care spending in the future is because of the aging of the population, not because of “excess cost growth.” Thus even if we were to have “excess cost growth” in line with the OECD average, we would still have total health care costs rising because of the imbalance in financing due to aging. While its both cost per case and demographics, its my understanding the CBO among others have revised their thinking, in that much of the cost growth–short term over the next 10-20 years–has more to do with folks ageing into Medicare vs the intensity path. Long term is another story. The link you provide above from two years ago precedes this pivot in outlook. I’d need to see that, but we are also concerned with long term here, not short term. I have talked to Don about this in the past, and he was kind enough to post up on the same subject after I emailed him. Aaron, my point is that the CEPR calculator is not a projection. The CBO baseline is a projection that takes into account demographic shifts, however the OECD line is not a projection — it is simply plugging in their historical growth rate into the future — this is an unfair apples-to-oranges comparison. The proper comparison would be to take the CBO baseline and compare it to an OECD baseline. Or, you could take our baseline and only swap out the portion of the baseline that grows because of US levels of excess cost growth (that is per capita health care inflation above economic growth) and replace it with OECD levels of excess cost growth. Crudely using only per capita levels of health care spending is crazy because under no health care system reform could we ever get down to European levels of per capita health care spending. The best we can hope for is to get to European levels of health care spending growth. Now, that would be a major accomplishment, although one that we have come close to achieving in the CBO baseline for Medicare already because of the ACA. And even with the benign outlook for Medicare, we still have major deficits in the long-term future. Why? Because we need higher taxes and further spending reforms to account for the growth in spending due to aging. The CBO projects that by 2035, 65% of the increase in mandatory spending is due to the aging of the population alone — not health care inflation. Many things to unpack here. First of all, yes, growth in the shorter term is aging, but not longer term. Eventually the baby boomers will be, well, gone. We’ll still be screwed. It’s not crazy to show what would happen if we mirrored other countries. I’m not suggesting that we will get there, and certainly not anytime soon. But it’s totally fine to show that if we could, we’d have no deficit problem at all. 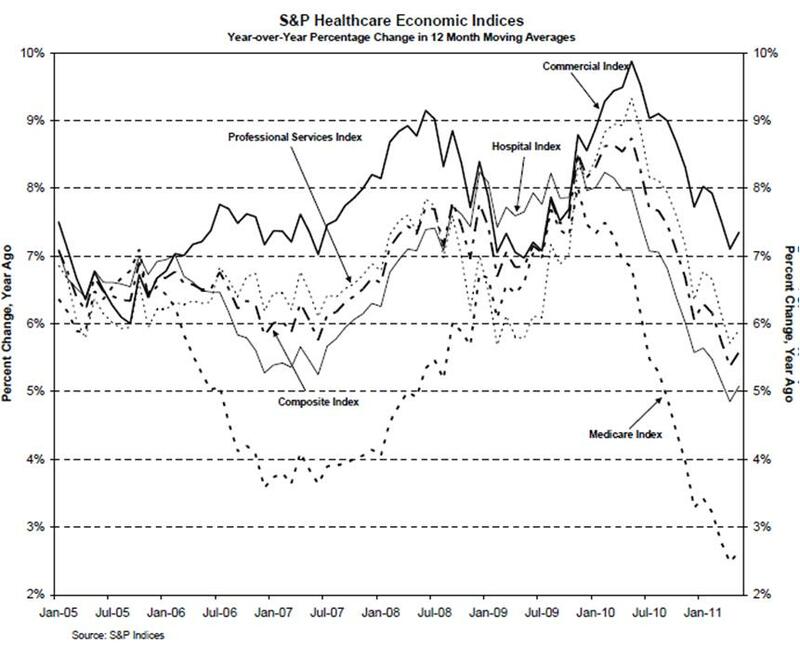 Health care spending is a fuction of many factors. An aging population, new technology, the economy disease burden, and other factors, all contribute to health care expenditure around the world. A good read.. The decrease is due to doctors and hospitals preparing for the full inplementation of the ACA in 2014, They are cutting costs. I guess I am not sure which years the naysayers are targeting. Here is June 2012: . I wish we could capture August as all the refunds went out then.